Put the vegetable mix in 550ml water and bring to boil. Add the soup powder and noodles and let it boil for 4 more minutes. Stir well and serve. Store in a dry place and protest from sunlight. This product may contain traces of barley, milk, eggs, peanuts, fish, celery, mustard, mollusc, crustaceans and sesame. 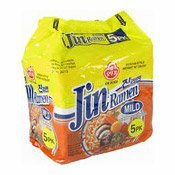 Ingredients: Noodles (106.8g): Wheat Flour (61%), Modified Starch (Potato, Tapioca), Palm Oil, Potato Starch, Wheat Gluten, Salt, Yeast Extract, Acidity Regulators (E501, E452), Colour (E101). Soup Powder (11g): Salt, Sugar, Flavour Enhancers (E621, E627, E631), Soy Sauce Powder (Soybean, Wheat, Salt), Hydrolysed Vegetable Protein (Soy, Wheat, Corn), Red Chilli Pepper, Soybean Paste Powder (Soy, Wheat), Yeast Extract Powder, Garlic Powder, Palm Oil Powder, Glucose, Black Pepper, Dextrin, Kelp Extract Powder (Kelp, Dextrin, Salt), Chilli Extract. Dehydrated Vegetable Mix (2.2g): Chinese Cabbage, Textured Vegetable Protein (Soy, Wheat), Carrot, Green Onion, Shiitake Mushroom, Seaweed.